Basel, located in the border triangle of Switzerland, Germany and France, is the cultural centre of Switzerland. And located at Messeplatz (where the Messe Basel Exhibition Centre is based) is Swissôtel Le Plaza, the largest hotel in Basel. Swissôtel Hotels & Resorts started in Switzerland but today they have properties in 40 locations worldwide each unique but all of them upholding the Swiss standards. So, when our visit to Basel materialised, it was easy to go with Swissôtel Le Plaza where 'quality of life' comes first. Swissôtel Le Plaza is a 4-star hotel located in Messeplatz, connected to the Congress Center Basel and just a 10-minute walk away from the city centre. As we walked into the hotel on a Sunday evening, I couldn't help but admire the tasteful and modern decor of the lobby. It looked very inviting. After being welcomed and a quick check in later we were handed the keys to our room - one of the Advantage Rooms on the fifth floor. Gracefully styled and with a large bed that looked very comfy and inviting, the room was of a good size. There was a large work desk, a Lavazza coffee machine, minibar, a laptop-compatible electronic safe, ironing facilities and Satellite LCD TV. All rooms at the hotel have free WiFi and air conditioning. Hotel guests also get free access to Pürovel Sport - the hotel's fitness centre which also has a sauna and a steam room. Yummy treats waiting for us! There were two things that I liked a lot about the hotel. First, they offered a 'Pillow' menu. You are given a choice of pillows to choose from - neckroll, anti-allergic pillow, comfort cushion trio, spelt pillow and Swiss stone pine shaving pillow to name a few. I went with the neck support pillow that offers optimal pressure distribution while supporting the head, neck and shoulders. Needless to say, I enjoyed a good night's sleep all the three nights. The second thing that I liked was that I could open the windows in the room! Swissôtel Basel is one of the few remaining hotels in Basel where guests can fully open the windows in their room. Most modern hotels in Basel have rooms where the windows don't open fully or are just not made to open at all (due to new building regulations). It was nice to be able to open the window and because we had a (partial) city view we also could see the Fasnacht procession down in the streets from our room. The bathroom was clean and of a good size. Bathrobes, slippers and toiletries from Pürovel were provided. Overall, the room was well appointed and comfortable. In addition to the Advantage Rooms, there are other options to choose from - Classic rooms, Premier rooms and for those seeking search ultimate leisure, there are three types of Suites - Junior, Plaza and Presidential. There are a total of 238 contemporary guest rooms in the hotel. Located on the ground floor is the hotel's restaurant - Grill25. We had our breakfast here every morning of our stay and it was very good. The buffet was extensive and the food well prepared. Eggs can be cooked to your taste. The service was good, the staff attentive and overall it had a nice ambience. Also on the ground floor is the lobby bar - a great selection of drinks, snacks and a good atmosphere. 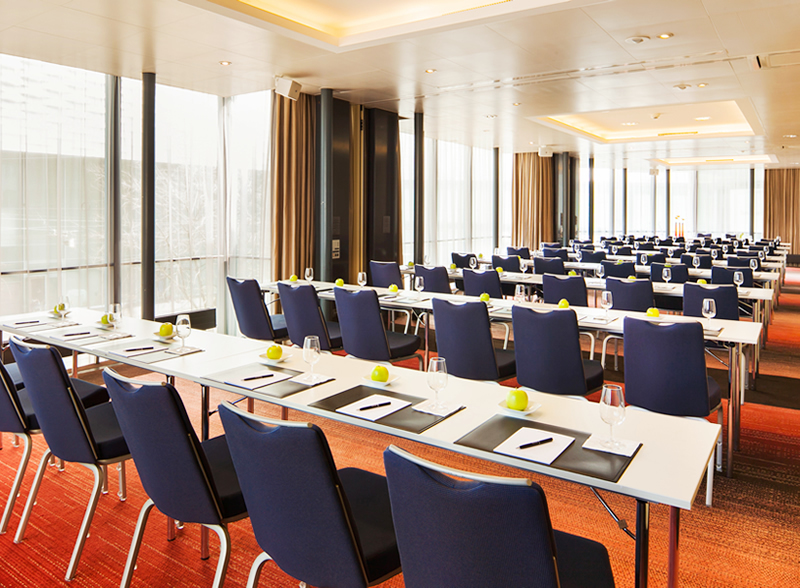 With a direct connection to the Congress Center Basel, 9 meeting rooms, functional furnishing, state-of-the-art technology and theatre style seating for up to 220 participants, Swissôtel Basel is an ideal location for social gatherings and corporate meetings including team building and conferences. Like I mentioned earlier, the hotel is ideally located to explore Basel. Plus, the complimentary BaselCard that the hotel offers all its guests enables one to use the public transportation system for the length of their stay (for free). Even the day of your arrival and departure are included in the card making it an added value. I think the aim of the card is to encourage visitors to use the public transport (which by the way is excellent) making it an environmentally friendly and sustainable way to travel. It works well both for the city and for the guests - a win-win situation! Basel is the cultural capital of Switzerland and is said to be home to more than 40 museums (Kunstmuseum Basel, Antikenmuseum Basel, Basler Papiermühle etc). As you must have noticed from my earlier posts, we visited Basel during the Fasnacht (the 'three loveliest days' of the year in Basel according to many we met during our visit) and most of the museums were closed during that time. But we still managed to make the most of our stay. Fasnacht was fascinating. When we had free time, we explored Basel as much as we could. Münster is Basel's cathedral located near the Rhine. It is a beautiful building built in Romanesque and Gothic style and is open to the public. Marktplatz is the main market square and Rathaus (the Town Hall) is located on the square. The beautiful red building is still in use for official purposes but the courtyard is free to enter and explore. Basel Zoo is also a very popular tourist attraction especially for families travelling with kids. We loved our stay at Swissôtel Le Plaza Basel. It is in an amazing location, has excellent amenities and very helpful staff. Quality of service was demonstrated by all members of the hotel team we interacted with. A hotel where individual guest needs are well looked after and where every guest is treated as they wish to be, we would definitely recommend checking out the hotel if you are planning to visit Basel. Thanks to the Swissôtel Basel team for inviting us along for this stay. As always, all opinions are my own. This looks a beautiful hotel. Switzerland is such a wonderful place to visit. The hotel looks remarkable. Will be the place to go for a romantic weekend away. Switzerland is stunning and Basel is considered as the cultural centre of the country. It also hosts a number of fairs and events all year round - a lovely place for a weekend away. A nice hotel for a business visit considering it is so close to the Exhibition Centre. Yes, but it is equally good for families too and they have interconnecting rooms for family travellers. The decor looks lovely. And I had not heard of this carnival before. I had never considered visiting Basel until I read your review. As a fan of museums,I could happily spend many hours visiting some of the 40 or so museums in the city. The hotel looks nice,love the photos of the meal,it looks delicious! If you are a lover of fine arts and culture, you will love Basel. Their museums cover painting, drawing, sculpture and all other kinds of art. The city's museums are one of its main touristic appeal. How lovely to be able to watch the procession from your room! There used to be a Swissotel by the Thames on London, not far from Somerset House, and while it was there it was our go-to hotel for city breaks, we loved the quality of the rooms and service. Yes, Swissôtel the Howard, which closed sometime in 2011 I think. Our room at Swissôtel Basel was on the fifth floor and we could see the procession as it passed on the road below. It was lovely. It is a wonderful carnival with its roots in old traditions. What a lovely hotel, the yummy treats look nice and it's great that you can choose your pillows. Yes, the Pillow Menu is a nice idea. Every room is provided with a pillow menu with detailed descriptions of each type of pillow. I Love the look of this place, I may have to add it on to my “places to visit” list. Great looking hotel, looks very inviting. Basel is a lovely city, Sophie. I am sure you will like the place and your stay at the hotel. Both are recommended. wow - the hotel looks absolutely superb - nothing more important than a really comfy bed and hot shower ! This hotel looks really great. Would be lovely to visit someday to celebrate a special occassion. Such a lovely and cozy hotel which I would love to stay in one day. The design is breathtaking and I love the small details. It is a lovely hotel and caters to both business and leisure travellers. Love Switzerland, so clean and easy to get around. The hotel looks wonderful and the beds, pillows amazing Hoping to visit soon. Yes, so easy to get around using public transport. We found Basel's bus and tram transport network excellent - organised, punctual and nice, modern vehicles. Agree, all of Switzerland is beautiful! Sitting on the Rhine, this small city packs in a lot in terms of cultural life. Basel also hosts a number of fairs and events all year round making it a lovely place for a weekend away. Always wanted to spend some time in Switzerland and this hotel looks lovely . I really like the bathrooms . The hotel would be a lovely base for your Basel holiday. I've never been to Switzerland but this article makes me want to go. It looks so fresh and interesting. Hope you get to visit Switzerland soon, Kate. Basel is a lovely city, Claire. You must plan a trip. Having read through this post I was most interested in the hotel. I love the decor, especially that beautiful chair with the silver legs! I've also never heard of a hotel offering their guests a choice of pillows before. I also liked the fact that they cook your eggs to your specific preference. It looks and sounds like a lovely, modern hotel. Yes, the pillow menu was a nice touch. Everyone has different tastes when it comes to their pillows and the option to be able to choose the one that works the best for you was a nice idea. The hotel looks and sounds great. The photographs of the fabulous architecture are amazing. A really good review which I enjoyed reading. Looks like a nice place too. That's wonderful. I hope you plan a visit soon. This looks amazing. Switzerland is such an amazing country and this hotel looks lovely. Thank you, Caroline. Because of the short flight distance, Basel makes for an ideal weekend getaway from the UK. Would love to visit Switzerland, looks beautiful. This looks and sounds idyllic. I'm not a huge hotel person, not since we converted a van into a camper, but a bit of luxury is always a treat. Amazing hotel and so nice that you can choose your own pillows for the night. Gorgeous hotel! Lovely classic and elegant furnishing, just my kind of place - love it! I've been to Switzerland once before many years ago and I can remember how horrendously expensive everything was so I'm not sure I could drag hubby back, but it is a lovely country. The photos are wonderful. I have never visited Switzerland, but I would love to one day. Wow the hotel and Basel looks amazing, I'll have to add it to my wish list! I really like that they have neck support pillows and the food looks really good, I am going to check this out.